Blightsteel Colossus ($70.99) Price History from major stores - Mirrodin Besieged - MTGPrice.com Values for Ebay, Amazon and hobby stores! Card Text: Trample, infect Blightsteel Colossus is indestructible. 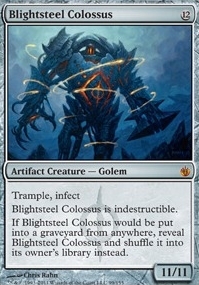 If Blightsteel Colossus would be put into a graveyard from anywhere, reveal Blightsteel Colossus and shuffle it into its owner's library instead.